Creamy soup without the added fat of cream. In a large saucepan saute onion and garlic in margarine until onion starts to caramelize. Add the chopped mushrooms, 1 cup of water, and salt. Cook until wilted and reduced. 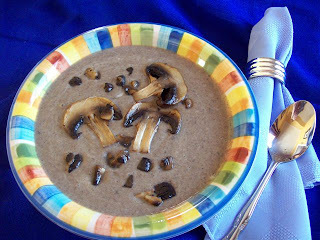 Remove 1 cup of drained mushroom mixture and set aside. To the mushroom mixture left in the pot add the remaining 3 cups water, soy milk and bouillon cubes. Bring to a simmer to dissolve the bouillon cubes and then remove from heat. Add the potato flakes and using an immersion blender, puree until very smooth. (If an immersion blender is not available use a regular blender.) Return pureed mixture to burner and add the reserved mushrooms and onions. Heat thoroughly. Makes 6-8 servings. *I used white button, shiitake, and Portobelo.